People have asked me what Down syndrome is. My explanation is that our bodies are made up trillions of cells, with each cell containing chromosomes which carry the genetic material (DNA) which is the starting point for each of us, determining everything from our gender to our physical characteristics like hair color. There are 23 different types of chromosomes in each cell, and we have two of each (one from mom, one from dad) for a total of 46 chromosomes. 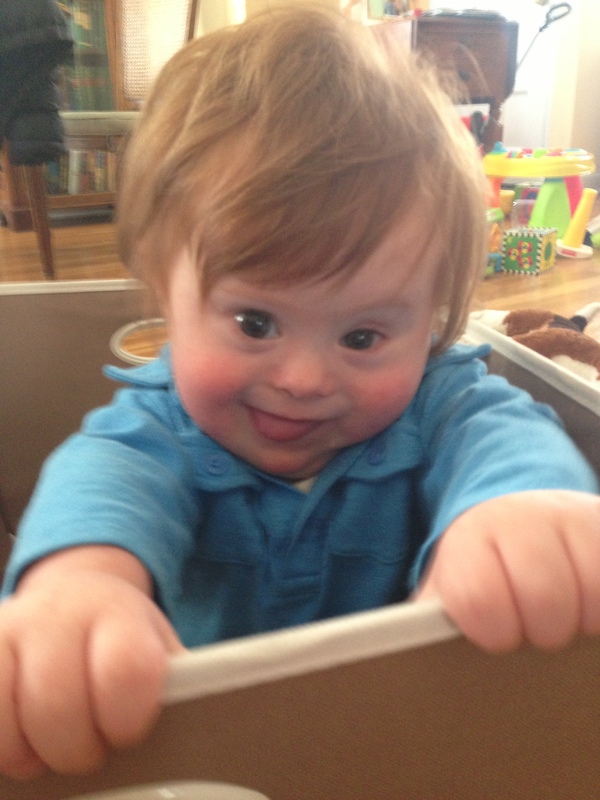 People with Down syndrome have those same 46, but also one more — an extra 21st chromosome. Fortunately, the 21st is the smallest chromosome, which means that if you were going to mess up a chromosome, that’s the one to pick. But these chromosomes are in every cell in the body, meaning that although the impact is relatively small, it has an effect on the entire body. This is why people with Down syndrome often have not only some cognitive delays but some physical challenges and often health risks. That extra 21st chromosome is just a little ‘sand in the gears’ that throws certain things off just a little bit. But it also means that the far, far majority (over 98%) of their functioning and appearance and everything else is inherited from their parents (red hair and all). 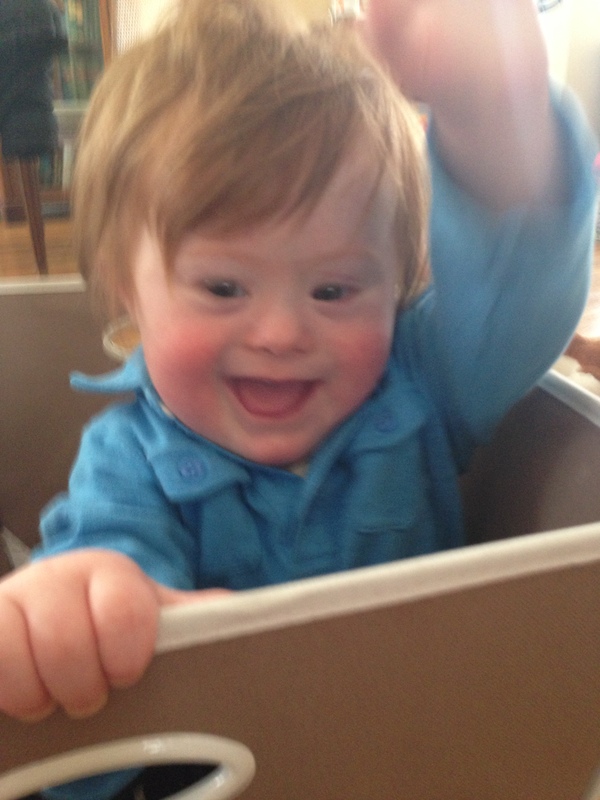 Thursday was World and National Down Syndrome Day (March 21st or 3-21 for the third 21st chromosome). The day is meant to raise awareness about Down syndrome and people with disabilities. It’s timely because of the sad story of a man with Down syndrome in Maryland who was accidentally killed, which was a reminder of why loved ones fear for a vulnerable person –whether Down syndrome or otherwise vulnerable – finding themselves in the wrong circumstances. This motivates us to get more involved in the local disability community — in addition to just wanting to connect with people in similar circumstances and be aware of resources for support. On Thursday night, we attended a gathering at a great new place called GiGi’s Playhouse for people with Down syndrome and other disabilities. It was amazing and really heartwarming to see 100 people there — kids of all ages with Down syndrome and their parents. Back to news at the Lee house — you never want to start a story out with ‘Hey, this could happen to anyone’, but that’s the deal here. Timothy is not yet walking, but he crawls like a mad man. One day I was with Timothy and stepped out of the room for a minute. When I walked back in, I was greeted with the silence of a toddler-less room. Calmly, I looked for him in one room and didn’t see him, so I looked more frantically in a second room and a third and still couldn’t locate the little man. Walking past the bottom of the stairs, I happened to glance up and saw the wee mountain goat perched up on the top step, looking back down at me. He looked adorable up there, but the urgency of getting him down won out and I walked up the stairs and whisked him away, and then reminded him to please be sure to put the baby gate up at the bottom of the stairs in the future. Laura saw Timothy crawl into our bedroom the other day, and he motored around the bed to my bedside table and pulled down the Vanity Fair magazine (for the record, it was the special comedy issue). When Laura spotted Timo, he acted casual and uninterested, although she found him twice more making the trip through our room to page through the magazine. Hey, you can’t blame a boy for wanting to stay abreast on the latest in toddler fashion and gossip. Despite many efforts at curbing it, Timothy remains a skilled and enthusiastic puller of hair. He has realized that he’s fighting a losing battle with my short hair, especially when he has bigger fish to fry with his sisters’ and mom’s long hair. Instead, he has changed the game and has started turning his gaze to my eye brows, stroking them with his hands and looking like Dr Frankenstein trying to figure out how best to use the little gems. I hate to disappoint the good doctor, but I may take the hint and get those caterpillars trimmed back a little. We try to read a lot to Timothy, which is good, but we get tired of reading the same books over and over. One of Timothy’s favorite books is Pickles the Fire Cat. We’re thankful for this book, as it’s helped encourage Timothy to vocalize more, by getting him to ‘meow’ (or at least make a sound that could be confused for a ‘meow’). But it’s 63 pages long and is not exactly a John Grisham page turner. I am generally a good, patient parent, but I too have my limits, and get tired of plodding through this book. So, as I was sitting with Timothy before bedtime one night recently, I was looking for way to speed up the process. So yes, I pulled the oldest parental reading trick of ‘summarizing’ a long page (seriously, only doing what the author should have done in the first place), and when T was turning the page, clustering two or five or possibly ten pages together in an effort to shorten ‘Pickles’ from a 15 minute tome to a bearable 4 minute sitting. The second time I tried to move it along, T stopped me, reached back and returned to one of the pages I had skipped. He insisted that we read it. I’d rather not relive that scolding at the hands of an eighteen month old, so we’d better buy some more interesting books. Or maybe we’ll just get the kid a subscription to Vanity Fair for his second birthday. 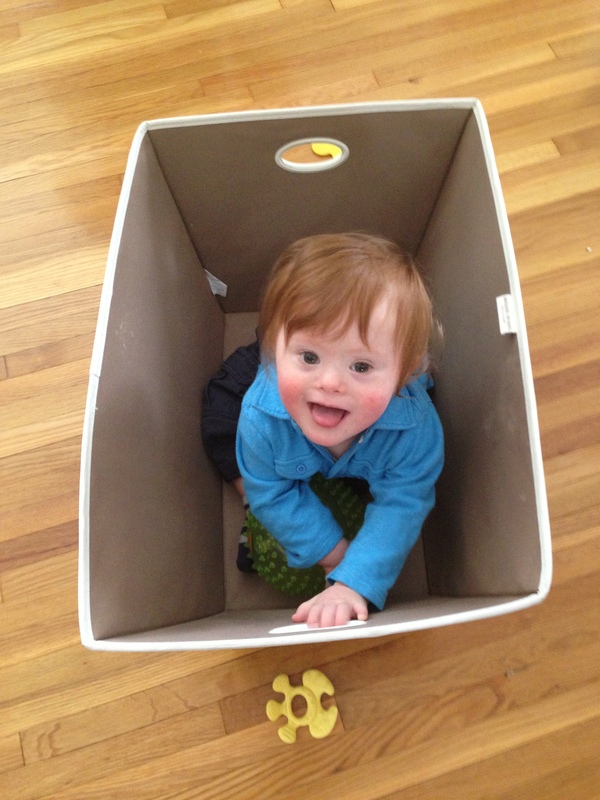 This entry was posted in crawling, Down syndrome, grabbing, Parenting lessons -- Don't try this at home and tagged Dr Timothy/ Mr TRBL, Gigi's playhouse, more hair pulling, new dog newer tricks, page turning, Vanity Fair, who's got the baby?. Bookmark the permalink. I am very un-tech savvy, but was able to set this thing up. Yes, I am using wordpress, and just went through their formats (I picked one called ‘Twenty Ten’ but there area whole bunch — some of which are free and some of which you pay for). It does not take any coding expertise to get started. I had a blog on Caring Bridge and just literally cut and pasted it over to this one. I’m sure that someone who really knows what they’re doing cuold make logs look really good, but it’s not necessary.